Humble city with vast history and paddy fields. What to do there? Alor Setar is a peaceful city, with most of the areas being villages surrounded by green paddy fields. There isn’t much activities to do other than exploring around town and enjoy some of Kedah’s best nature activities by doing trips from this city. For thrill seekers, try and take a 1 hour drive to Mount Jerai, a prominent place for hiking and camping among the locals. The peak of Mount Jerai is about 1200 metres above sea level and there are campsites around the area if visitors wish to camp. It is also home to the stunning Alur Naga Waterfall located near the top of the mountain Be sure to spend some time here for a swim or picnic! Prominent place for hiking and even for camping and waterfalls. If you are more interested in nature, you can also make a road trip to the nearby town of Merbok. By car, it takes a 1 hour journey from Alor Setar to Merbok. Here, you can do nature activities and explore the Merbok Mangrove Forest by a river cruise. Along the banks and mangrove swamps, you will get to see plenty of wildlife too! Tupah Recreational Forest in Merbok is also a great place for outdoor and nature exploration, or even for family picnics. If you plan to stay here longer, make a trip to Langkawi Island. From Alor Setar, head to Kuala Kedah Jetty and take a ferry ride to this duty-free island or also known as the jewel of Kedah. Langkawi Island is one of the popular attractions in Malaysia, so you can find a wide range of accommodation and other facilities for a better travel experience here. Aside from island hopping, snorkeling and diving, be sure to shop for souvenirs and local goods at a very cheap price in Langkawi! What to see there? Being the center of heritage in Kedah, it is home to plenty of historical spots and traditional sights embodied in walls of the calm and green city. The best way to experience Alor Setar city is by making plans to explore its heritage trails by foot so you’re free to stop for photos! Spot old buildings with classic architecture aging more than 100 years around the humble town. Start your heritage trail from a place of birth Malaysia former prime minister Tun Dr Mahathir Mohamad and end your trail at Istana Kuning or Yellow Palace. Make a visit to Alor Setar Paddy Museum located only 8km away from Alor Setar city centre. Or take some time to appreciate the fine art in Kedah State Art Gallery. With an architecture influenced by east and west of ancient Roman, the gallery displays local artworks from painting to carving. You can also visit religious attractions in Alor Setar such as Wat Nikrodharam Buddhist Temple and Albukhary Mosque, each being distinctively stunning on its own. If you love heights, Alor Setar Tower is a great place for sightseeing. Rising above 165.5 meters from the ground, it is probably not a suitable place for those who fear heights. From the top observation deck, visitors can get a bird’s eye view of the humble city at best! After visiting the tower, just walk to Pekan Rabu Complex if you need to shop for things such as souvenirs, local products and goodies. This is the best place to get some memorabilias from your trip and also to try out some local delicacies unique to Kedah. 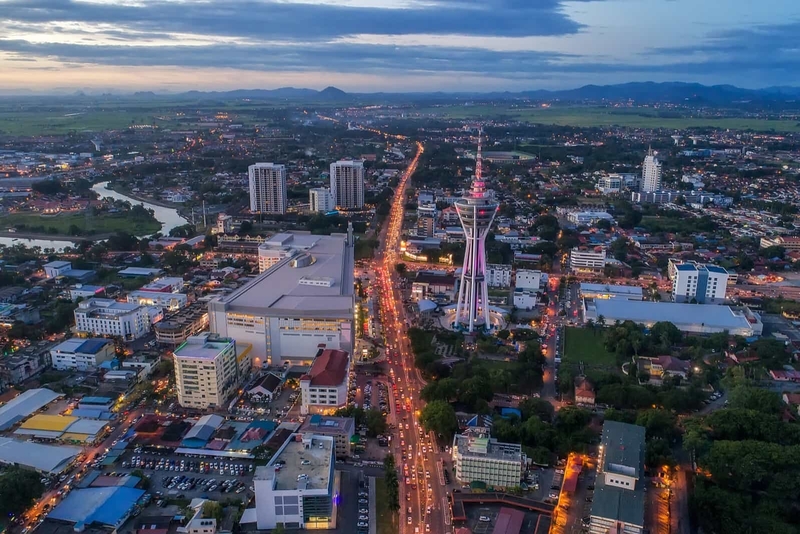 Alor Setar geographically located near neighbouring country Thailand. Continue your trip to Thailand by train is the most convenient way. From Kuala Lumpur, you can take a 1 hour flight to Alor Setar or drive for a journey of roughly 5 hours. The best way to explore Alor Setar city is by foot. However, if you are travelling in groups, it is best to rent a car at a reasonable rate to ease your journey. Since the city isn’t fully urban and modern, there are limited public transportation around town. It is best to use a ride-sharing app. The northern region of Malaysia is known for its scorching hot weather on most of the days. Be sure to wear light and comfortable clothing for your trip here. Grab a delicious cup of coffee and try a slice of the tasty cakes offered at Caffe Diem tucked within Pekan Cina. This colonial era themed cafe makes a great place for photos too. Expect a relaxing retreat and an adventure to explore hidden gems as the humble and oldest city in this region has been around for more than 260 years.